SILICON SLOPES, Utah – March 22, 2016 – Today at Domopalooza, Domo launched Buzz, an entirely new social collaboration platform for the Business Cloud that weaves business data into the social fabric of your organization to speed insights and drive decisions that improve performance. Buzz is available for free to every employee and every company, including non-Domo customers. A radical upgrade to Domo’s existing collaboration feature and under development for several years, Buzz gives business decision makers one platform to use with co-workers, teams, departments and across organizations. Key features that other solutions charge for, such as user and team administration and unlimited search history, are also free with Buzz. 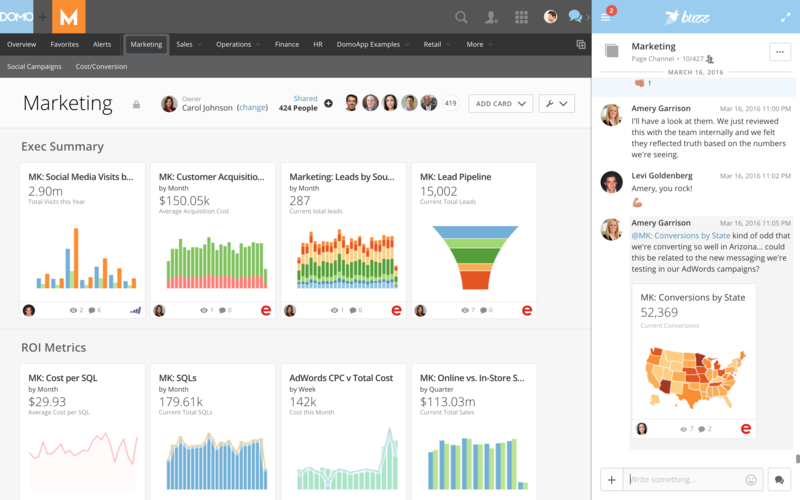 Buzz comes with a set of free dashboards around popular metrics such as social media performance to demonstrate the ease at which data can be uploaded and leveraged in Domo. For existing Domo customers, Buzz is an automatic upgrade. It is configured so organizations can invite at no cost a broader base of users throughout their organization to collaborate for insights on business data and performance. Like all aspects of the Domo platform, Buzz is easy to use. Users log in with their work email address for access to instant communication with all co-workers using Buzz. For the individual worker, Buzz provides an easy-to-use collaboration platform that everyone in the organization can use to pass notes, give comments, view project metrics and integrate into existing workflows – without training or long adoption cycles. For more information, go to domo.com/buzz.